We get it—sometimes plans change. If you need to edit the dates for dog boarding or house sitting services, here’s how to make changes both before and after the stay is booked. Note: If you need to edit the dates for day care, dog walking or drop-in visits, check out this article. 2. Under the Pending Requests tab, select the correct conversation. 3. Locate the gray request details box on the left side of the page and update your booking as needed. The price will automatically adjust to reflect any changes. Note: If your sitter has already accepted the booking request, the gray box will instead prompt you to either Accept Request or Decline Request. To edit the service before booking, select Decline Request first. 4. Select Book It Now. You're all set! 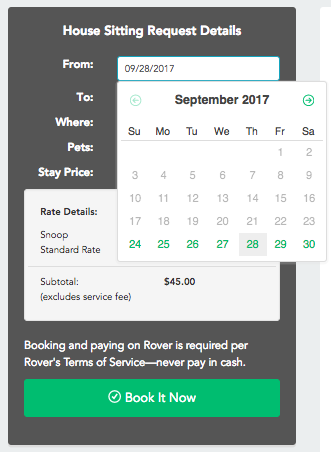 If you need to change the dates after already confirming the booking, contact your sitter via Rover Messages. If they agree to the date change, they can modify the booking from their account. Once your sitter makes the change, you'll need to confirm the modification from your account. For information on how to accept changes to a booking, check out this article.